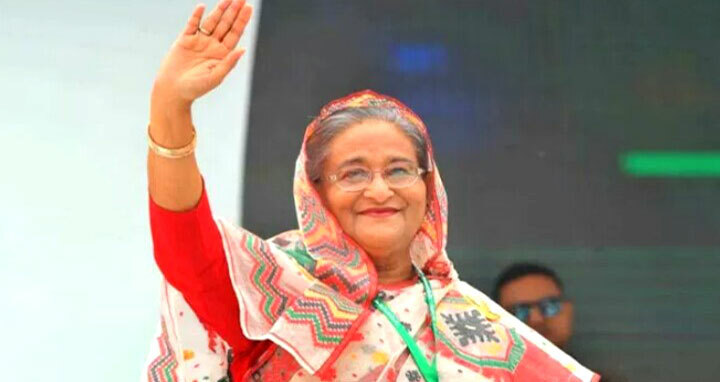 Dhaka, 24 September, Abnews: Prime Minister Sheikh Hasina arrived here this afternoon local time (BD time on Monday morning) from London on a weeklong official visit to the United States to attend the 73rd Session of the United Nations (UN) General Assembly. A British Airways flight carrying the premier and her entourage members landed at Newark Liberty International Airport, New Jersey at 2:10 pm local time. Bangladesh Ambassador to the USA Mohammad Ziauddin and Bangladesh Ambassador and Permanent Representative to the UN Masud Bin Momen welcomed the premier at the airport. After the reception at the airport, a ceremonial motorcade escorted the prime minister to Hotel Grand Hyatt New York, where she will be staying during her visit to the USA. Earlier, the prime minister departed from Heathrow Airport in London for New York at 10:50 am local time. She made nearly two-day stopover in the British capital en route to New York. Bangladesh High Commissioner to the UK Nazmul Qaunine saw the premier off at the airport. The prime minister will address the 73rd Session of the UN General Assembly at the UN Headquarters in New York in the evening (local time) on September 27 and have a meeting with UN Secretary General Antonio Guterres on the same day. On the sidelines of the UNGA, she will also hold bilateral meetings with a number of world leaders including Estonian President Kersti Kaljulaid and Dutch Prime Minister Mark Rutte. The Bangladesh premier will attend a Welcome Reception to be hosted by US President Donald J. Trump, while US Secretary of State Mike Pompeo is expected to call on Sheikh Hasina. This year’s theme of the general debate is ‘Making the United Nations relevant to all people: Global leadership and shared responsibilities for peaceful, equitable and sustainable societies’. The prime minister will place some specific proposals in continuation of her previous five-point proposal for resolving the Rohingya crisis, Foreign Minister AH Mahmood Ali told a press conference at the Foreign Ministry on Thursday. During the UNGA, Ali said, Prime Minister Sheikh Hasina will receive two awards. He said Inter Press Service (IPS), a global news agency, will give its prestigious ‘International Achievement Award’ to Prime Minister Sheikh Hasina for her dynamic and farsighted leadership in addressing Rohingya crisis while Global Hope Coalition will confer on her ‘2018 Special Recognition for Outstanding Leadership Award’.